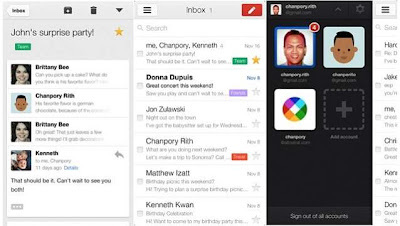 Google today updated its Gmail App for iOS and has rolled out a brand new 'inbox'. With this the version number of the Gmail iOS App is now 2.3.1. The highly professional looking INBOX lets you control it rather then other way around. This brand new 'inbox' is similar to what is being offered on PC to desktop users with you getting to choose what goes where. This will be particularly beneficial to the users who receive heavy amount of emails. The new categories which are introduced are social notifications, deals and offers, confirmations, and so on. This way your all Facebook, Google+ and other social mails will be clubbed under one window. The important mail will be received in the Primary mail box. And the offers etc. will go into Promotions mailbox. What's more the update also brings new notifications options for iOS users, thanks to which, they can opt for being notified for messages, only important messages, or for none at all. They can set these changes in a per account basis. Additionally, these changes can be customised from the in-app settings page. This is a fun way of checking your mail. I am already using this method on PC and like it very much. So head over here to Apple Store to download the latest Gmail for iOS App. PC users can also opt for the professional INBOX by going to settings ( a little gear at the top right) and choosing configure INBOX from there. Thats it, you now have a professional looking INBOX like the one described above.